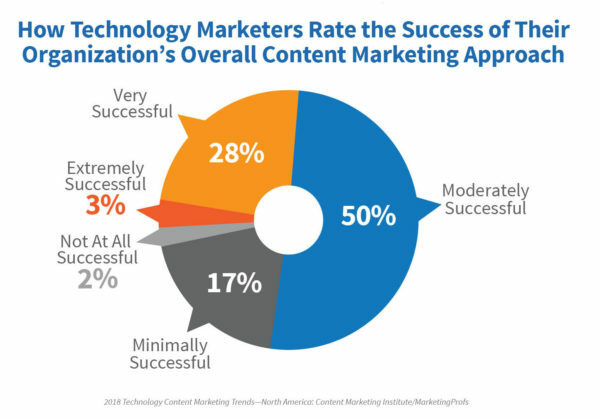 In addition, another 50% of technology marketers this year report “moderate” success. And, like the previous year, nearly 70% say their organization’s overall approach to content marketing is “much/somewhat more successful” compared with one year ago. 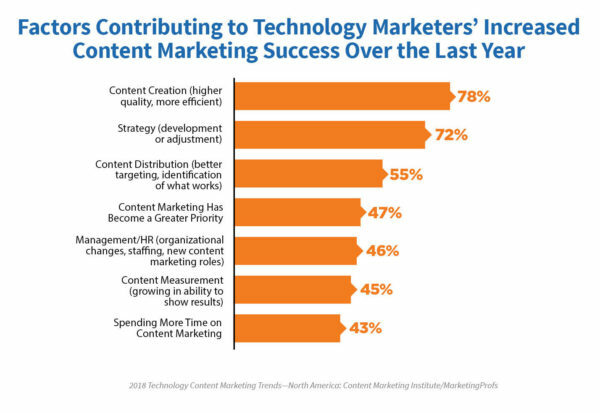 As you can see in the report, Technology Content Marketing 2018: Benchmarks, Budgets, and Trends—North America, sponsored by IDG Communications, Inc., most respondents attribute increased success to getting better with content creation and developing or adjusting strategy – the same top factors cited in the previous year. Therefore, when we see notable shifts in their replies to our annual content marketing survey, we think carefully about what those responses might indicate. This time, three areas caught our attention. Top performers among tech marketers held steady year-over-year, with 78% reporting they always or frequently prioritize providing the right content to the right person at the right time. However, the total group had a big jump, with 63% reporting they do this (vs. 49% the previous year). Getting the right content to the right person at the right time requires a deep understanding of your audience. Solid buyer personas certainly play a role. But personas, while a convenient shorthand, are neither a one-and-done proposition nor the final word on understanding audience needs. Forward-thinking marketers generally give more consideration to what their targeted audiences or personas need in any given moment. And, as Robert points out, they use data and technology to deliver the content when it’s needed most. That brings us to the somewhat surprising finding about the buyer’s journey. In our recent research on B2B North America marketers, we found that B2B marketers in general reported a decrease in “always/frequently crafting content for specific points in the buyer’s journey” (53% in 2017 vs. 41% in 2018). Top-performing technology marketers: In 2017, 81% of top performers said they always or frequently craft content for points on the buyers’ journey. In 2018, only 67% answered that way. All technology marketers: In 2017, 60% said they always or frequently focused on creating content for the buyer’s journey. That dropped to 50% in 2018. Why do B2B marketers in general (and tech marketers specifically) seem to be paying less attention to the buyer’s journey when crafting content? For one thing, there isn’t just one version of the buyer’s journey. Some say it has three phases, while others identify five or more. It can vary depending on the nature of your products and services – and the buying process that prospects/customers follow is never linear anyway. Robert offers this insight to explain why more marketers say they focus on creating the right content for the right person at the right time, yet fewer report crafting content specifically for the buyer’s journey: “It could be a semantical difference to some degree, but rather than the ‘old-school’ development of content for the buyer’s journey, we’re seeing a focus on dynamically serving up content in the audience’s time – no matter what stage they happen to be in. Is your company moving to new models like ABM and/or tiring of the “craft content for the buyer’s journey” approach? If so, let us know in the comments section why, how, and where you’re shifting your approach. The percentage of all technology marketers surveyed who agree their leadership team gives them ample time to produce content marketing results increased from 51% to 66%. Among the top-performing technology marketers in the group, the percentage increased from 81% to 88%. Even the least successful technology marketers reported an increase in leadership support (20% to 40%). How much is ample time? 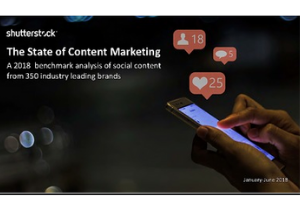 That depends on many factors including the targeted audience, the level of “content saturation” in the subject area (i.e., how much content on the subject exists), the quality of the content, the accuracy and timing of distribution, and more. CMI founder Joe Pulizzi says it can take 12 to 18 months to see content marketing results. It can take 12 to 18 months to see #contentmarketing results, says @joepulizzi. 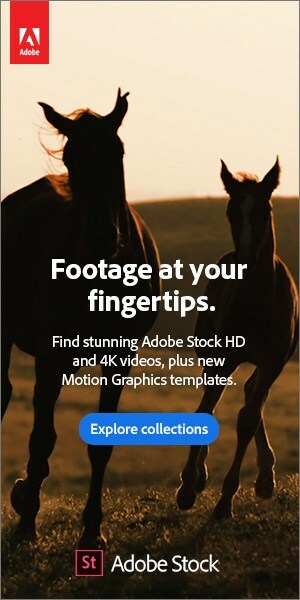 If you’re among the technology marketers who are not getting ample time to produce results, see these resources: Looking for Content Strategy Buy-In? Don’t Rely on the Same Old Arguments and 7 Ways to Stop Flailing with Your Content Marketing in 2017. We’d love to hear whether your company is moving toward new models of creating relevant content, how and where to target it, and when. Wouldn’t it be interesting if the marketers given ample time to produce results are among those who are trying new things? How excellent would it be if leadership gave ample time for its teams to learn new procedures that over the long run produce better results? If that’s your situation, let us know. If not, let us know that, too. 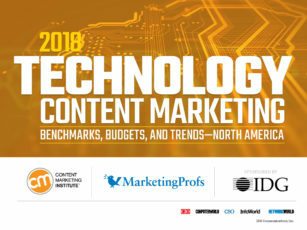 The full Technology Content Marketing 2018: Benchmarks, Budgets, and Trends-North America report offers a big-picture glimpse into how marketers at tech companies approach content marketing. See how top performers do things differently than their peers, how much budget they spend on content marketing, how well content projects flow throughout the organization from concept through completion, and more. Want more insight? Join us for a one-day Technology Industry Lab at Content Marketing World on Sept. 7. And come earlier in the week for Content Marketing World. Register today using code BLOG100 to save $100. The post Tech Marketers Think Outside the Buyer’s Journey [New Research] appeared first on Content Marketing Institute.